Use Promo Code: ESPN to receive a key ring gift with purchase. Enter in the "Promotional Code" field at the bottom of the checkout page. 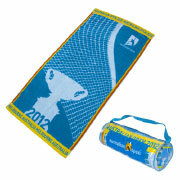 Code works with any Australian Open player towel sizes.